The installation consists of a gigantic glass prism with a rectangular base, which is split in the middle to disclose a silky texture that longs to be touched. The rectangle is covered with letters through which we distinguish the excerpt of a text. The team from Éric Pelletier, architectes has designed a work of art that is masculine, strong, dark and subtly sensual, a reflection of the poet who inspired it. Leonard Cohen's A Thousand Kisses Deep / Dans les profondeurs de mille baisers evokes thoughts about the man and his poetry, but especially on the depth and mystery of rich artistic production. 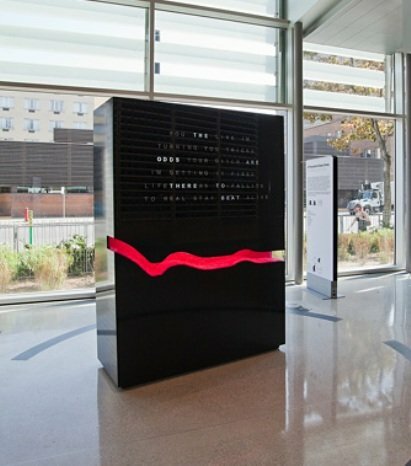 From May 18 to October 31, 2010, in the entrance hall of the Grande Bibliothèque, Bibliothèque et Archives nationales du Québec (BAnQ) will be hosting the exhibition Architectures en vers, which consists of five architectural installations inspired by poetry. These installations were created by collectives of well-known and up-and-coming architects working with glass artists. The exhibition is presented as part of the “Montréal, 2010 City of Glass” program, under the direction of the Board of Montreal Museum Directors.